Undersea Dives is looking to add new team members! We are looking to hire PADI Instructors and Dive Masters for our weekly shore and boat dives along with teaching PADI Courses. We are looking for candidates who know the local area and want to share their passion for diving with others. If interested please contact Whitney at dive@underseadivers.com. It’s that time of the year again. We are prepping for our Annual Spring Sale. Join us on the weekend of May 14th & 15th for huge savings. Everything goes on sale in the store. It’s the perfect time to get new gear to start off the dive season right! Masks, Snorkels, Fins, Wetsuits, Accessories, Lights Computers, Regulators, Gear Bags, Rashgaurds and much more! Here are just a few items that will be going on sale. We have so many choices at the store, we can’t post them all! We give you 2 options with purchasing tanks. Both always include FREE VIP’s for Life. Option 2: Buy 2 tanks and receive free air for life. 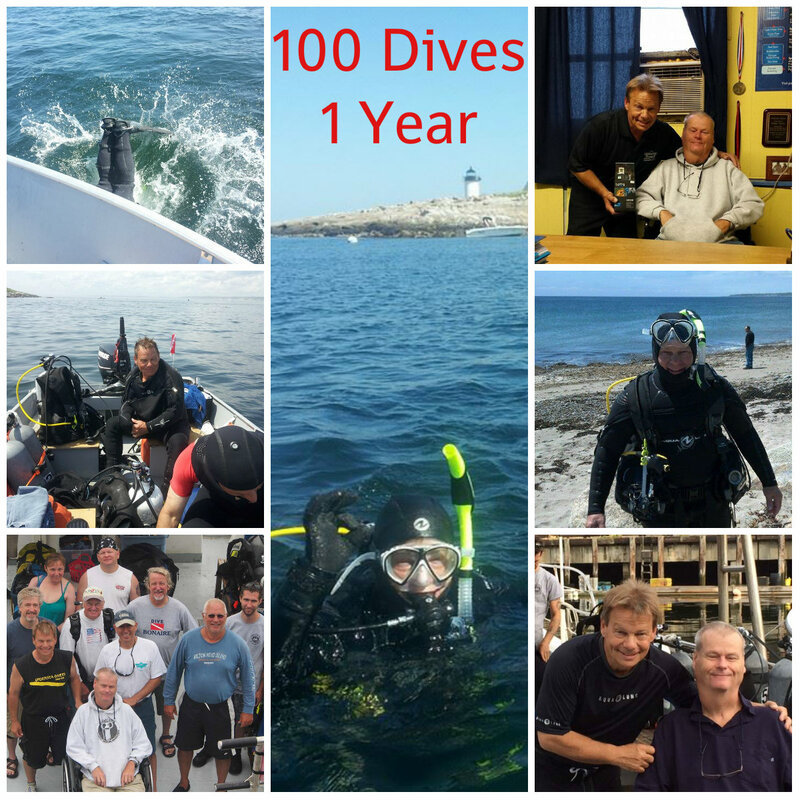 Learn to Dive or continue to expand your dive skills. Many dive classes will be on sale. Pay for the course now and you will have the opportunity to take the class up to 1 year from the purchase date, so no rush on choosing dates if you don’t know your schedule yet. Just lock in the great price! GoPro Accessories: 10% off ( Unfortunately we cannot discount the cameras themselves. Do you rent gear more than 1 time a year? Well the Undersea Divers rental Card is for you. Purchase the rental card for $40 (Regularly $50) and receive HALF PRICE RENTALS FOR LIFE! Yes, you saw that correctly, for life. Cut your costs in half but double the fun! Air cards are a great way to save money on fills but now you can save even more! 10 Fill Card: Regular price of $80. Sale Price $70! That’s only $7 a fill! 30 Fill Card: Regular price of $195. Sale Price $180! That’s only $6 a fill! 60 Fill Card: $300 (cash only). That brings your fills down to $5 each! Know that we will do special orders for you if you don’t see a product you are looking for in the shop. Can’t make it on the sale weekend? No Problem! Give us a call to order over the phone. Don’t Forget our Maintenance Packages when you buy a new piece of gear! Learn more about the packages here. Everything goes on sale that weekend. Classes, Air Cards, Gear & More! Stay tuned for our full Sale Flyer Soon! Peter Shelley of the Conservation Law Foundation will speak about Cashes Ledge and the Canyons national preservation at the meeting of the North Shore Frogmen. There will be a short club meeting at 8 followed by the presentation. Arrive at 7:30 for social gathering. Guests are welcome. Held at the Palmer Cove Yacht Club in Salem. 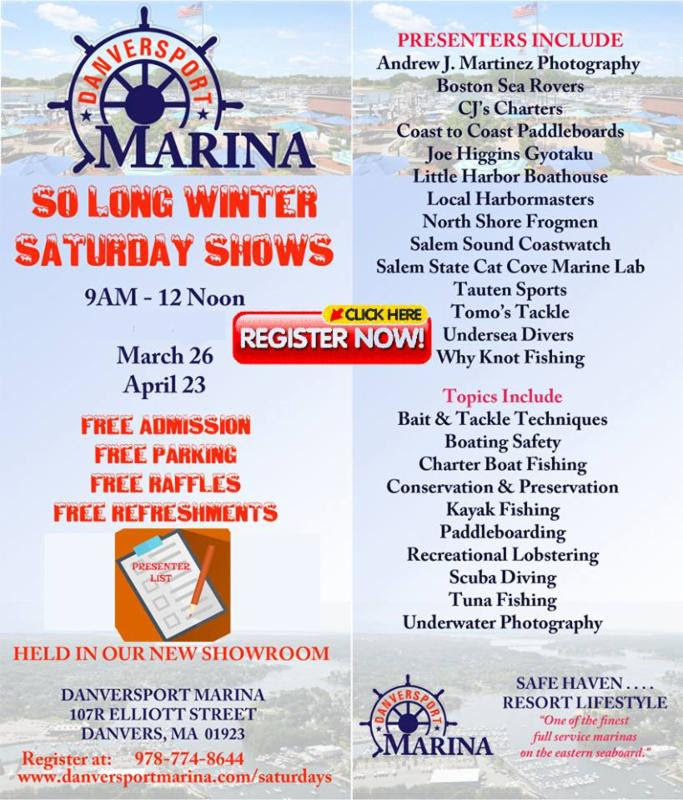 Join us for the second Saturday Show at the Danversport Marina Showroom. There will be booths with local businesses, raffles and light refreshments! We will be hosting our monthly Photo Meeting on March 31st. Andrew Martinez will give a short talk on Traveling with Camera Gear. We will also have members presentations from our Bonaire trip and Andy’s recent trip to the Philippines. Peter Lake will be presenting his experiences as writer and producer of “Making of the Deep” at the North Shore Frogmen meeting on Thursday April 7 at 8:00 at Palmers Cover Yacht Club in Salem; social gathering at 7:30. Guests are welcome. Held at the Palmer Cove yacht Club in Salem, MA. Evelyn Bartram Dudas first breathed compressed air in the early 1960’s when the sport of scuba diving was newly born. After obtaining her dive certification at the University of Buffalo in 1964, she returned to West Chester PA and began diving off the Mid-Atlantic coast at every opportunity she had. During a dive trip in 1965 on the recently sunk tanker Stolt Dagali, she met John Dudas, and they became frequent diving partners. Evelyn was the first woman to dive the Andrea Doria, one of the first women to use mix gases, and also the first to start a custom wetsuit company where one could not be found commercially. Her story has graced the pages of Skin Diver, Newsweek, National Geographic, Franklin Mint Magazine, and Harper’s Bazaar to name a few. She appears in the DEMA/Jack McKenney video Scuba Dive America. Evelyn was inducted into the Women Divers Hall of Fame in 2000, and is still diving wrecks and caves to this day! Come hear how she and her husband retrieved the coveted compass from the luxury liner along with many other fascinating stories at the North Shore Frogmen meeting on Thursday March 3 at 8:00 at Palmers Cover Yacht Club in Salem; social gathering at 7:30pm. Desserts will be served.